This particular jewelry is multifunctional and focused on the work of the blue color and its variations that may be encountered in semi-precious stones. It was inspired by a place that fascinates me because of its arrangement and its colors, the Majorelle garden, hence the name. The Majorelle botanical garden is a one-hectare park of Marrakech in Morocco. It has become a great tourist attraction of the Moroccan city. There are nearly 300 species of plants and the Museum of Berber culture. The Majorelle Garden is deploying a range of blue shades that constantly inspire me. This ultramarine cobalt covers the walls of the villa and makes us travel to warm and exotic lands. Yves Saint Laurent fall in love and eventually acquire this magnificent garden. You can combine this sterling silver chain into several different types of jewels: a necklace, choker, an extra long bracelet or an anklet. It is 95 cm long. 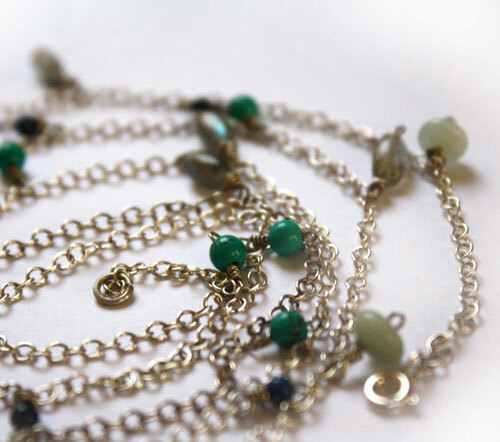 It is composed of a thin sterling silver chain and deep to lighter semi-precious stone beads ranging from deep blue to a cerulean blue: turquoise, amazonite, labradorite, lapis lazuli, blue jade to remind palette of different blue shades of Majorelle. It is perfect to wear every day. Discrete. Delicate. Feminine. Tag: anklet, necklace, choker, bracelet, sterling silver, labradorite, turquoise, amazonite, blue, navy, sky, natural, handmade, vintage, antique, feminine, delicate, gift, unique, nature, elegant, discreet, lapis lazuli, jade, garden, color, sea, exotic, Majorelle, Marrakech, Morocco, heat, botanical, tourism, fascination.